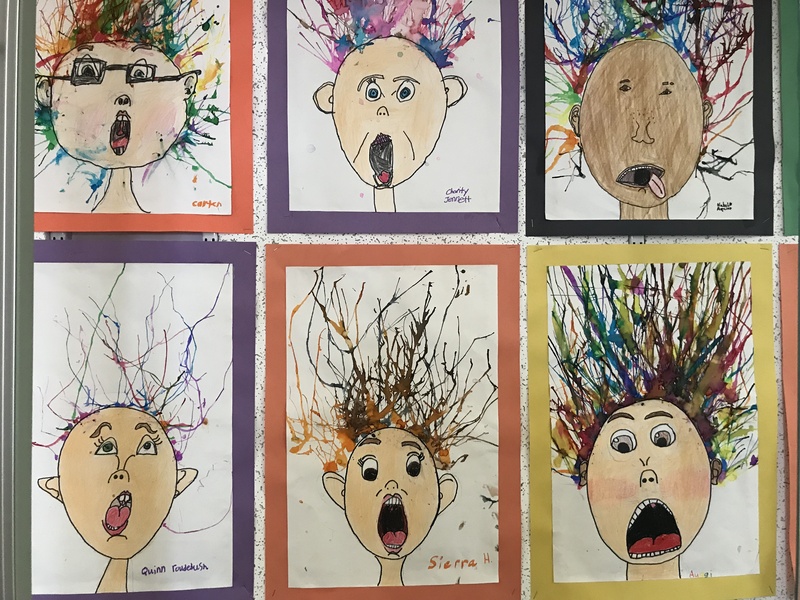 Third grade created screaming self-portraits inspired by the artwork, “The Scream” by Norwegian born Expressionist painter, Edvard Munch. Through storytelling students integrated the visual arts and ELA. The students had to use their “Visual Thinking Strategies” to analyze the painting and make inferences as to why the character was screaming. In addition, they had to tell a story for several hilarious, American, pop-culture parodies of “The Scream” painting. For example, they had to explain why the Joker was screaming, and why Batman was in the background. Furthermore, students had to write about what gives them a fright. Then they had to draw themselves screaming by thinking of what they wrote. 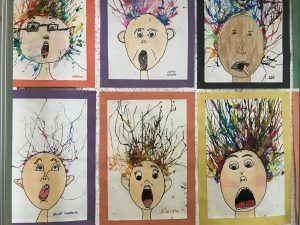 In their artwork, students focused on capturing and enhancing the details of the expressive qualities of their petrified facial expressions. Lastly, they integrated human geography with visual arts by studying the expressive qualities of Japanese painting technique called, “Ink blowing” which was used to create their static hair. Their static hair helped tell the story of their petrified facial expressions. Students were able to get inspiration from the art of Norway, U.S.A. and Japan which influenced their artistic process and approach mentally, emotionally, and physically. The third graders were super engaged throughout the entire artistic process and were very happy with their screaming results!